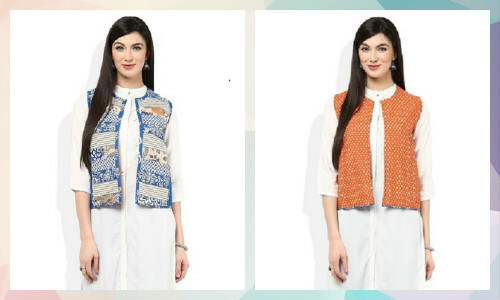 15 AMAZING Reversible Tops & Kurtis - 2 For The Price Of 1!! Dear ladies, How many times have you wished that you never run out of sartorial options while dressing up? What if you just had to spend your money for one and you got the benefit of two? Sounds like a dream, doesn’t it? Well, Being an overachiever is never bad! So we bring to you these amazing reversible pieces that will give you the benefit of two in the price of one. And, they say looking good is pricey! *eyeroll* Happy shopping! This gorgeous reversible top from FabIndia is cotton made and has a Chinese collar. If that wasn’t alluring enough, It has a hue so bright that it can light up the gloomiest of your days and add colour to the dullest of your outfits. Price: Rs.890. Buy it here. This reversible checked shirt from Roadster is the best we have seen today. We totally love the colour, both on the inside as well as the outside. Price: Rs.599. Buy it here. This charcoal grey and white pattern knitted reverse print top, has a round neck, cap sleeve, and elasticated hem. And we just CANNOT get over the price! What else do you even want? Price: Rs.269. Buy it here. 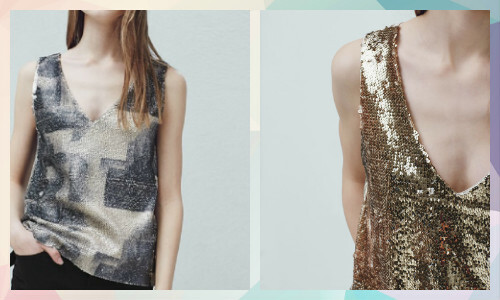 This amazing reversible waistcoat from W is faultlessly made for the ultimate style. You can wear the striped side or turn it over to flaunt the fun, printed side - the choice is yours! Price: Rs.1,274. Buy it here. This long cotton kurta has a simple beaded neckline that makes it look extremely graceful. Just pair it up with wide pants/palazzos or simple leggings and you would be good to go. Price: Rs.1,490. Buy it here. Dyed using the traditional dying techniques, this yellow-blue reversible top is an investment for your wardrobe. It would be a perfect friend for the days when you stand in front of your wardrobe completely distraught. Price: Rs.690. Buy it here. A little bling never hurts anyone. This Mango sequin top is a live example. 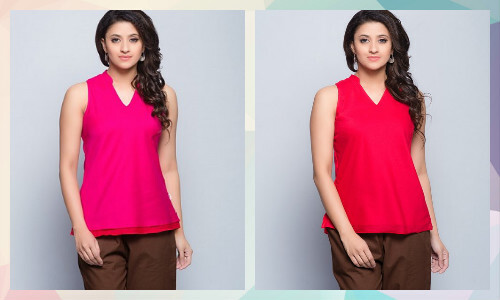 Show off your fun and experimental side in this gorgeous sleeveless top. Don’t forget the added perk- It’s reversible! Price: Rs.890. Buy it here. This striped beauty is a must have in your wardrobe. This is a very basic top that can be teamed up with almost anything. And we cannot forget the best part - It has heart prints on the insides.So just flip it over to create a completely new look! Price: Rs.629. Buy it here. 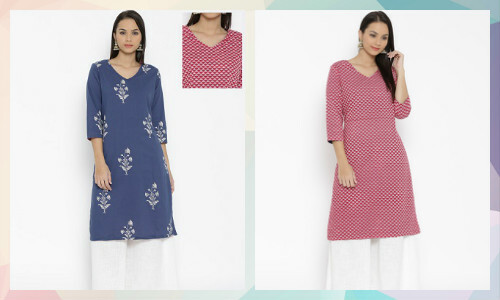 We are totally crushing over this cotton reversible kurti from FabIndia. 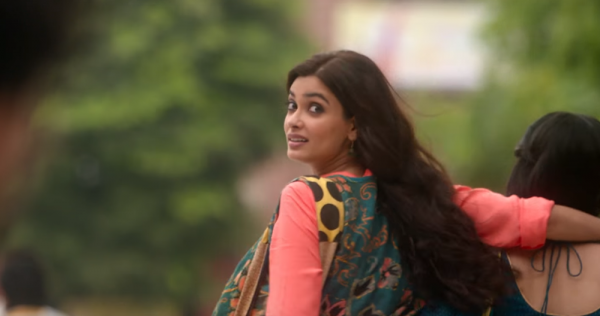 Patiala and kolhapuris are the only things required to rock this desi look! Price: Rs.990. Buy it here. 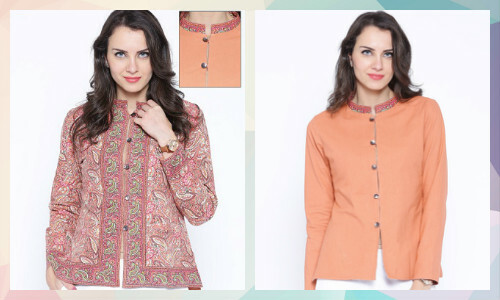 Bring out your Indie-chic side in this stunning reversible jacket by W. Wear it over kurtas or long tops for a perfect summer outfit. Price: Rs.1,019. Buy it here. This crop top from Forever New is every girl’s dream. It is a perfect example of double-duty clothing and you can wear it in two different ways. This top is fit to be your day-to-night companion. Price: Rs.1,200. Buy it here. 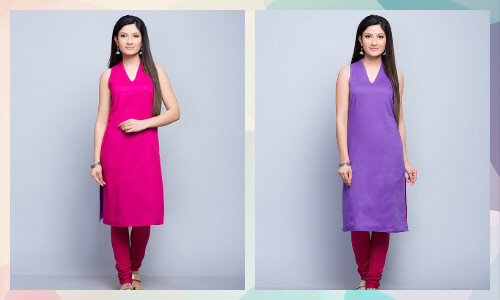 Elevate your style quotient with this classy pink and blue reversible kurta from Rangmanch. It has an inner print of blue florals and dons a pink geometric pattern on the outer side. Pair either side with white palazzos, flats and silver jewellery for a perfect ethnic look. Price: Rs.1,199. Buy it here. 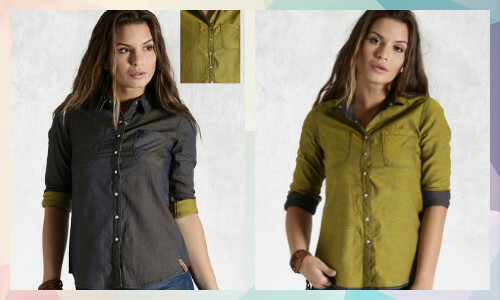 What’s better than a casual shirt - a two toned reversible shirt that gives you the benefit of two pieces in one. 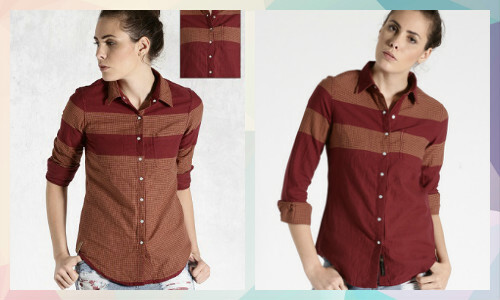 This casual shirt from Roadster is exactly what you need for a perfect ‘girl next door’ look. Price: Rs.749. Buy it here. Buy similar one here. Simple styling and clean cuts make this jacket from Anouk an absolute must-have in your closet. It is reversible and has the perfect blend of contemporary and ethnic. Button it up and wear it as a top or throw it over a simple tee/kurta with leggings and heels for a chic look. Price: Rs.1,539. Buy it here. 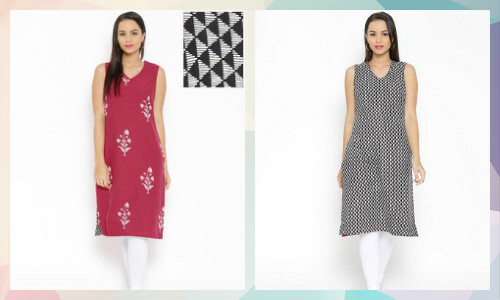 This gorgeous kurti from Rangmanch in pink and black will make you look stunning. It has a floral printed side as well as a black and white printed side. Guess the best part? Both the sides are equally pretty and totally different from each other. Price: Rs.1,199. Buy it here. So girls, what are you waiting for?! Start shopping for the most useful item in your closet!